The File menu controls the check-out, check-in, saving, printing, and export of PDF files, and the display of Document Properties. 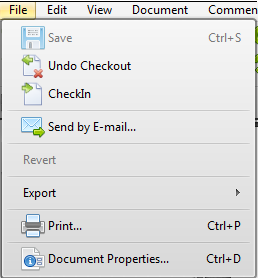 Revert option will undo any unsaved changes and revert to the "original" state of the document. Export allows you to export a selected page(s) or selected area of a page as an image file. Document Properties enable you to read and create an information about your PDF file (info, security method, appearance, actions when a document is viewed and more in a window Document Properties.